In one of the most bizarre op-eds I've ever seen, AFT President Randi Weingarten partners up with former NYC Mayor Michael Bloomberg to argue that we can expect more from teachers when we "pay them like pros." They evoke much-maligned Common Core test grades as evidence of their success in having done this.They then go on to praise the 2005 UFT Contract, probably the worst I've ever seen, as a model of cooperation. That contract was what turned me into a union activist. It was full of goodies for the mayor, and the entire concept of more work for more pay does not remotely resemble the concept of paying people like pros. It's more like paying people like they worked extra hours at Burger King, which also translates into more money. 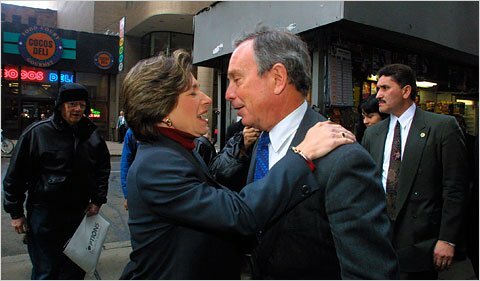 Worse, Weingarten seems to have forgotten that Michael Bloomberg was the most anti-public-school mayor in the history of New York City. They both seem to have forgotten how many schools Bloomberg closed, in a failed Gates-inspired experiment to create "small schools" Even as Gates himself admitted it was a bad idea, NYC continued. Our foray into small schools left in its wake a whole lot of tiny islands of newbies with little or no union representation. Bloomberg and Weingarten further seem to have forgotten the incredible rise of privatization in the form of largely non-union charter schools, a phenomenon that continues even as we speak. Another thing that appears to have slipped their minds is the miserable relationship between the UFT and DOE he engendered, a relationship that continues to this very day. Even as Michael Mulgrew and Carmen Fariña got along with one another, even as we elected a mayor who appeared to repudiate his anti-teacher positions, Bloomberg's people sat around in Tweed and practiced the same nonsense they had for years. De Blasio didn't clean house when he came in and has yet to do so. I have at least seven outstanding Step Two grievances in the system right now. Most are for blatant violations like letters in file after 90 days, refusing to pull a letter over three years old, or failing to meet with member, let alone allow representation, before placing a letter in file. Since Bloomberg, we almost always lose at Step Two, regardless of the merit of our arguments. UFT reps have told me that was not the case before Bloomberg. DOE has the ridiculous option of having 48 school days to make a Step Two decision, and delay is one of the things they do best. In fact I believe I now have cases that have gone over that limit, and I'm not yet sure there's even a consequence for that. I don't know how they select people at DOE "legal," but I can tell you for sure they haven't got the remotest notion of what reading English entails. Even as Common Core (or whatever they're calling it this week) pushes joyless close reading for excruciating and minute detail, they sit around in Tweed in cowboy hats, riding stick horses, shooting cap guns, and advising principals to do any damn thing they feel like with no regard whatsoever for working teachers. They're right in a way, as blatantly abusive administrators are reassigned to sit around Tweed or run Townsend Harris High School. Mike Bloomberg, who now fancies himself a champion of teachers, dismantled our seniority system in 2005. Teachers at a loose end, rather than being reassigned to another school, are now placed in the Absent Teacher Reserve, a sort of purgatory for working teachers. Though UFT leadership claims it's just a temporary thing, it's gone on for 13 years with no end in sight. In fact, Mike Bloomberg refused to grant us the raise and contract he gave NYPD and FDNY unless we allowed ATR teachers to be fired. That's why all of us are still waiting to get back 75% of the money NYPD and FDNY earned back in 2009. As if that's not enough, Mike "Pay like a pro" Bloomberg wanted to fire half of us and leave those still standing with classes of 70. I've just scratched the surface on what Bloomberg did when he was mayor, but just about any teacher who lived through his regime will tell you he treated us like something he wiped off his Florsheims. I have no idea why Randi Weingarten thinks his argument adds credibility to hers, but I haven't had the opportunity to ask. Michael Bloomberg, for my money, is every bit as hypocritical and delusional as Donald Trump. Maybe all that money does something to your mind. I don't suppose I'll ever have enough to verify one way or the other. Still, I always remember the line from If I Were a Rich Man, in which Tevye the milkman sings, "When you're rich, they think you really know." Michael Bloomberg didn't know what our job was on his best day. I'm not sure exactly when that was, but I'm certain it's way in the past. Given the outlandish nature of this article, I'm quite sure it's never coming back. Related: Here's another critique of this op-ed by Mitchell Robinson.